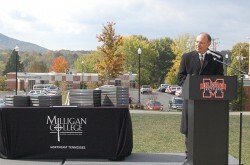 Milligan College President Dr. Bill Greer delivers remarks at the Milligan Village Dedication Friday. The sense of community at Milligan College runs deep. At Friday afternoon’s Milligan Village Dedication, each and every speaker stepped to the podium to share how important the communal aspect is, and has always been, in the Milligan College experience. This aspect got a big boost at the beginning of this past fall semester, when the college’s five new residence halls were completed. Milligan President Dr. Bill Greer shared how excited the students were to get into the new dormitories for themselves, and how much it added to the school’s prestige. The eight-person Heritage a cappella group sang to the event’s crowd, which totaled around 100 people on the common area between the five buildings. The new halls, named Hampton, Jeanes, McAnally, Pardee and Wigginton, titled after the project’s top supporters, form a big u-shape that opens up a view of Buffalo Mountain. Seniors Anna Lenox, a nursing student who transferred from Florida State University, and Corey Hendren, a business major, both live in the new village and shared their perspectives of their Christian, liberal arts school with the crowd. They wouldn’t trade their experience at Milligan for the world, and both emphasized the communal aspect that is unique to the college. Hendren, who was recruited to the school to play basketball from South Carolina, is one of the people living in Hampton Hall. Just outside of Hampton is the new venue for one of the most popular pastimes on campus: volleyball. Because of the contributions of Burleson Construction, whose contributions to the school and project are numerous, the volleyball court has been named after the company. Living in Hampton, Hendren says, has given him an opportunity to experience just how popular volleyball is. He said if the weather is nice enough, people will be outside his hall playing all night long, whether it’s one-on-one, or 30 people playing. Burleson Court shows what’s going to be so beneficial to the entire campus with the completion of the project. Students and faculty have a new common area that will give space for new activities. Mark Fox, vice president for student development and dean of students, closed the ceremony with a joke and a prayer, saying the inhabitants of the new residence halls have been referred to as “The Village People.” After the dedication, attendees moved into Jeanes Hall for refreshments and a chance to see the layout of one of the buildings. One of Greer’s favorite aspects of the completed projects was that the whole thing came in under budget and on time, which is often a difficult task to accomplish. With a wet summer, Greer was unsure if the final touches, like the parking lots and landscaping, would be complete in time for classes to begin and to attain a Certificate of Occupancy. As fortune had it, all the goals were reached, if not surpassed. He said this type of financial responsibility shows Milligan in a positive light as it moves forward to continue bringing in donors. The Gilliam family of Charlottesville, Va., was thanked for their continued support of the college, as were Dr. Marshall and Jean Leggett, whose support garnered them their namesake on the road behind Milligan Village — Leggett Lane. Read the original story on JohnsonCityPress.com.